I am the daughter of an amazing dad, I was the granddaughter of an incredible grandfather. I am now a wife to my sons first hero, and my daughters first love. More often than not, dad’s are the behind the scenes parents. They don’t get near the recognition we mom’s do, or that they deserve. I grew up, and continue to be surrounded by, strong, kind, funny, and compassionate dad’s . Yes my dad (dad’s, because now I have two thanks to my husband) and husband, but my circle of great dad’s is full: my brother, Uncle’s, grandpa, family friends. I truly believe that because I was surrounded by such strong dad influences, I knew what a good man was and I knew when I had one. As time marched on, and with having our children, the amazing list of dad’s was extended to my children. Often when faced with chronic illnesses in children (especially in disorders with stereotypes and stigmas) parents differ on how these deal, handle or cope. We (men and women) are wired differently, us mom’s tend to become more emotional and consumed, and we talk more, a lot more. That’s not to say that dad’s don’t feel the same losses, stresses etc, they just deal handle and cope differently. In our case that usually means my husband levelling me out, calming me down and standing strong while I crumble while dealing with whatever it is that needs to be dealt with as well. It’s often mom at the forefront, at appointments, meetings etc. I think I’ve attended one meeting alone. And I’ve never had to drive alone to a critical appointment. I am not alone in being my children’s parent, ever. I think of the hospital stays dude has had, when my husband did the drop offs alone because I found it to hard, where almost every day dude had a visit from papa, uncle’s (and aunts) checking in and delivering books and treats. 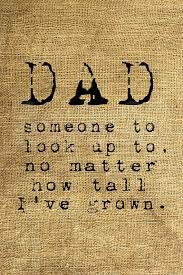 I think of the support, love and uninhibited acceptance the dad’s in our lives give him. How I am often amazed at how those dad’s just get him. How all of these grown “guys guys” will be soft when needed. They don’t judge, they don’t question, they accept what is, and because of that, my son has amazing role models in fatherhood. I think of our daughter and how blessed she is to have all of these men surrounding her. Watching her bond with her dad is one of the most incredible gifts I’ve been given. He truly is her best friend and he her biggest fan. How it’s usually her dad or papa not missing a game, and always there cheering her on. With so many wonderful men, there’s no wonder why she’s who she is. How she’s surrounded by men who adore her. I often think of her future husband, and what big shoes he’ll have to fill because she’s already such a strong young lady and those dad’s in her life all have big feet. They accept her and love her and give her value and strength, and because of that my daughter has amazing role models in fatherhood. I count the dad’s in my life as one of my biggest blessings. Without them I wouldn’t be the person I am. Without them I wouldn’t be the mother I have become. Because of the dad’s in my life, I am lucky! You are currently browsing the Bestkids's Blog blog archives for June, 2015.